HOW DOES IT COMPARE HISTORICALLY TO THE SOUTH EAST AND NATIONAL PROPERTY MARKETS? Living in our own homes or owning buy to let property in Worthing and the surrounding areas, it`s often easy to ignore the regional and national picture when it comes to property. As a homeowner or landlord in Worthing, consideration must be given to these markets because directly and indirectly, they do have a bearing on us in Worthing. Locally, the value of property in Worthing and the number of people moving remain largely steady overall, although looking across the country there are certainly regional variations. Talking to fellow property professionals in the posh upmarket central London areas of Mayfair and Kensington, the number of people looking to buy and registering interest with agents is continuing to climb after 18 months in the doldrums, whilst in other parts of the UK there is restraint amongst both buyers and sellers. So looking at the numbers in greater detail, let`s see what type of new homes people have been buying in the Worthing area. Look further afield, a resilient property market depends on the UKs economic health with the outside world, so if Sterling weakens imports become more expensive, meaning inflation increases, which is something I talked about a few weeks ago. Earlier this month, to bring inflation under control, The Bank of England chose to raise interest rates for only the second time in a decade which could seriously affect the property market. On the assumption Brexit negotiations are successful, economic growth should continue to be upward and positive, meaning confidence would increase, which is the vital element to a good housing market. That means a Worthing homeowner has profited by an additional £102,559 over the last 20 years compared to the average homeowners across the country. I found it interesting to see the ups and downs of the Worthing, South East and National markets in this graph. 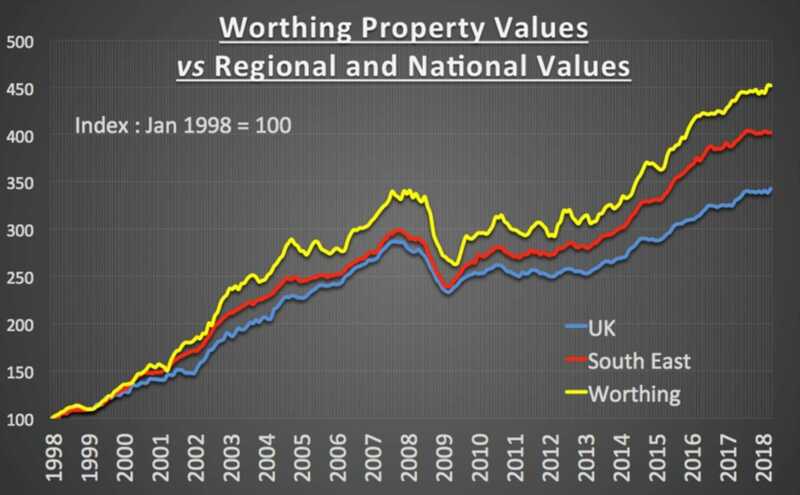 The correlation between the three markets is fascinating - Worthing follows the regional trend more closely than the national trend (as one would expect), however the 2007/08 property crash timings and effects were slightly different, as were how the markets performed in the post-crash years of 2011 to 2014. So, what does this all mean for Worthing homeowners and Worthing landlords? Well, house prices going up or down are only an issue when you buy or sell. In the last 12 months, only 1,076,288 (let`s call it`s a straight million between friends!) properties changed hands out of 27.2 million households in the UK in 2017, meaning only 3.7% would have been affected if property values had dropped in the last year. The final thought for this article is this, apart from central London, over the last 20 years it hasn`t mattered what part of the UK you were in with regards to the property market. Be you a landlord or homeowner, property is a long game, so look long term and you will win because until they start to build more homes, from the current levels of 180,000 new homes built per year to at least 250,000 households built per year, demand will, over the long term, outstrip supply for owning and renting!